An exquisite Murano glass vase made in the ancient incaminciato technique. This style is characterized by its thin, double layers, obtained by successively collecting layers of different colored glass out of the furnace's pot. 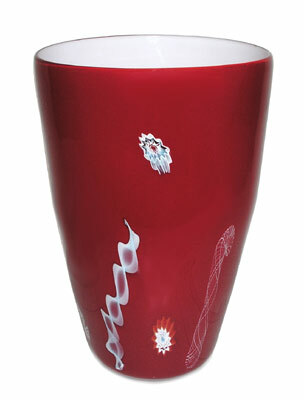 This vase features a deep red exterior with accents of canne, over an interior of white. Round bottom flaring to an oval top. Approximately 8 inches tall.